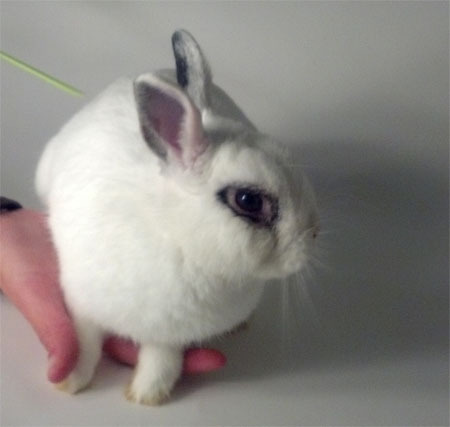 I've been adopted and now have a pretty girlfriend bunny---also from SaveABunny! Hihi! My name’s Zipper and it’s a pleasure to meet you! I’m a cute hotot boy that just loves to say hello to everyone who comes into SaveABunny. I’m still a little feisty at the moment. I’ve been told it’s because I haven’t been fixed yet. I'll be neutered soon, but you don't need to "fix" cuteness like me! I’m full of energy and very inquisitive. Every time they put in a newly filled hay holder, I just have to get to the bottom of it to see if there’s a toy surprise. So far, I haven’t found one. Why don’t you come by and find a prize of your own? That’s ME!